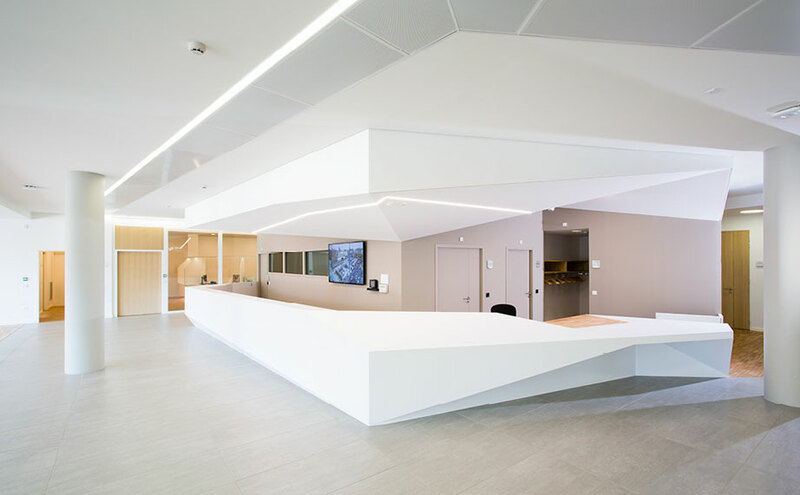 We can find KRION® in the exceptional 17 metre long reception counter, for which the 1100 Snow White colour was selected, the colour which combines all features of the solid surface from PORCELANOSA Group. The work was supervised by the S&AA architecture studio (Strasbourg), whose work began in 2015, with “CM Distribution” as the transforming company in charge of manipulating our materialKRION®. Jeremy Rauscher from CM Distribution tells us… “It is like a work of art; many hours and almost surgical detail were required. One of the challenges was to respect the lines of the front, and manage some technical details, such as the weight of the swing door which allows employees to access the client reception counter, which is covered with KRION®. The result is a visual impact with very aesthetic and smooth continuous lines, and a texture that is like natural stone. The counter was pre-assembled in the workshop, and then mounted at IHU”. Architects: Agence S&AA Patrick Schweitzer (Strasbourg). Construction: KS Construcciones in association with Karl Storz and Siemens Healthcare.